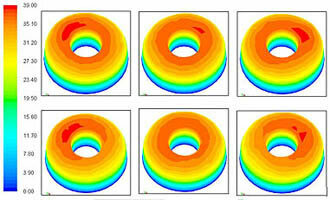 The Objective: To improve air flow uniformity at each burner exit by design modification of the wind box. 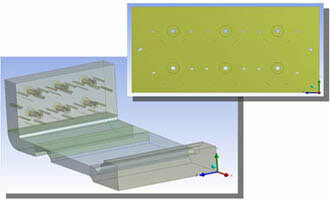 Solution: The wind box consisting of burner arrangements were first modeled through CAD tools and uniformity across the burner exits was measured. In order to improve the uniformity, use of baffles at several different locations around the burners were suggested. The simulation for the new configuration reduced the flow rate difference below 2 percent, proving the significance of the optimized wind box design. The combustion efficiency inside the boiler is highly dependent on the air fuel ratio available for the burner. The wind box utilized to supply air for combustion has to ensure uniform air flow distribution across each burner, in order to ensure complete combustion. However, due to complex wind box design, chances for incomplete combustion are always present, due to the non-uniformity of the air flow across the burners. Optimizing the flow distribution, in a manner where there is uniform air available at every burner exit, maximizes the combustion efficiency and thereby improves the overall plant efficiency. A leading power plant manufacturer from Mexico needed a design solution to address similar issue for their wind box, utilized for combustion process in boilers. Fluid dynamicists at Hi-Tech provided a cost-effective solution to improve the uniformity in air flow distribution across the burners, through design modification and subsequent CFD simulations. In order to achieve uniformity in flow, the wind box was modified with additional baffles surrounding the burners, to direct the flow uniformly at each burner. It was observed that through different baffle arrangements, the velocity distribution across all the burners improved significantly. The difference in flow rates between the top and bottom burners were reduced by half, indicating better mass flow rate availability for complete combustion. Hi-Tech CFD is a division of Hi-Tech Outsourcing Services, a pioneer engineering outsourcing company since 1992 based in India & USA. It provides expert Computer Aided Engineering - CAE consulting services for engineering / product design analysis by modeling & simulation.